Boost the speed, capacity, and security of your home Wi-Fi network with the Nighthawk AC2300 Cybersecurity Wi-Fi Router from Netgear. Capable of up to 2.3 Gb/s of total Wi-Fi throughput, this dual-band Wi-Fi 5 (802.11ac) router supports multi-user MIMO technology, which helps to boost network speed and efficiency by allowing for multiple simultaneous data connections. 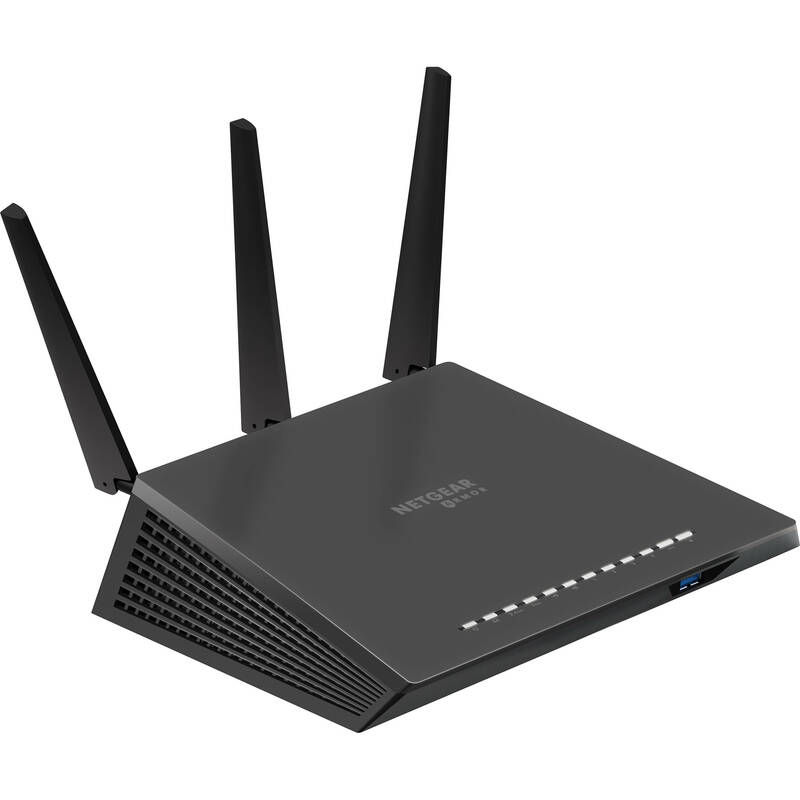 The Nighthawk AC2300 Cybersecurity router comes equipped with three detachable antennas, four Gigabit Ethernet LAN ports, and one Gigabit Ethernet WAN port. Netgear Armor support offers online threat detection, vulnerability scans for connected devices, and mobile threat alerts. ReadyCLOUD USB Access lets you remotely tap into storage devices connected to the router's USB 3.0/3.1 Gen 1 Type-A port, while Beamforming+ support is designed to focus the router's Wi-Fi signals onto nearby wireless devices. Provides a critical layer of online security for every device connected to the router. By actively blocking known malicious sites and applications, Netgear Armor helps to safeguard you from cyber threats such as ransomware, malware, phishing, and more. Includes Bitdefender Total Security to help protect your family's iOS, Android, macOS, and Windows devices, even when on public Wi-Fi. An unlimited number of connected devices are covered, including supported smart home devices. A three-year Netgear Armor subscription is included. Designed to identify and block viruses, spyware, ransomware, malicious links, and other internet scams. Regularly scans all connected devices at home to help ensure they are not vulnerable to hackers. If your mobile device is ever lost or stolen, Netgear Armor helps you to locate, lock, and wipe data on your smartphone or computer remotely. Immediate notifications on your smartphone or computer alert you when threats are detected and blocked. Automatically selects the ideal dual-band Wi-Fi connection for optimal wireless speed. Traditional Wi-Fi routers can stream data to only one device in the home at a time. When multiple devices are connected to the router, each device needs to take its turn, and then wait before receiving more data. This can lead to slower network and internet speeds. Using multi-user MIMO technology, the Nighthawk AC2300 Cybersecurity Wi-Fi Router can stream data to multiple devices simultaneously. With MU-MIMO, your Wi-Fi network can deliver faster throughput to every MU-MIMO connected device. That means faster downloads and smoother streaming for your devices. Dual-core 1 GHz processor helps to boost wireless, wired, and WAN-to-LAN performance. Designed to offer enough Wi-Fi coverage for very large homes, the router's three external antennas feature high-power amplifiers. Access and share your files via secure, personal cloud storage with Netgear ReadyCLOUD USB Access. Once you've connected your USB drive to the router and uploaded your favorite files, you can access your data via mobile app or web portal from anywhere you have an internet connection, without fees or storage limitations. Helps to boost speed, reliability, and range by focusing Wi-Fi signals on nearby wireless devices. Helps to reduce interference for better connections to more Wi-Fi devices. Dynamic QoS helps to resolve internet traffic congestion when you have competing internet demands at home. Dynamic QoS identifies your online activities by application and device, and then utilizes bandwidth allocation and traffic prioritization techniques to automatically allocate more bandwidth to latency-sensitive applications, such as online gaming and video streaming, while ensuring that lower-priority applications continue to work. Designed to intelligently select the optimal Wi-Fi band for every device connection. Uses one Wi-Fi name for the entire home. OpenVPN Connect app for iOS and Android allows remote secure access to the home network. Enables a separate and secure network for your guests. Delivers the latest security patches to the router. Connect to router via a secure connection over HTTPS.